Isla Chiloe is a beautiful destination in the Patagonia area of Chile. The town of Castro is the largest of the island, and makes a good base for exploration. How much do hostels in Castro cost? Located in a traditional Chilote house built in 1947, which blends rustic and modern decoration, 13 Lunas Hostel is a warm place that welcomes you with all the facilities that a traveller requires, making you feel at home. 13 Lunas Hostel is found right opposite to the bus station Southern Cross in Ancud, a few blocks from the main square, bars and restaurants, the city museum and the museum of Chiloe Iglesias, and a 10 minute walk to the market where you find delicious seafood, fish, vegetables and great handicrafts. The hostel offers a spacious fully-equipped kitchen; a dining room where you can enjoy a beer with other guests, have a nice chat about your experiences and make new friends; an outdoor terrace with a barbecue; a cable TV; a book exchange; a games room with a foosball and, obviously, breakfast, WIFI, luggages storage, lockers and laundry facilities. You will be able to choose between mixed dorms of 4, 5, 6 and 7 beds. Amarillo Hostel offers great accommodation in Ancud, only a 10-minute walk from the city centre, 2 minutes from the Bus Station and 5 minutes from the Municipal Market, where guests will find an array of commercial and gastronomical options. El Tepual Airport is 77 km away and a shuttle service can be arranged for an extra fee. At Submarino Amarillo Hostel guests will find a 24-hour front desk, a garden and barbecue facilities. Other facilities offered at the property include a shared kitchen, a shared lounge and a games room. An array of activities can be enjoyed on site or in the surroundings; guests also have the possibility to rent bicycles at the hostel. The staff is friendly and helpful and can answer any travel related questions you might have. Submarino Amarillo Hostel offers single, double and shared dorm rooms with beautiful views of the city. There are 3 bathrooms located in different areas of the hostel. The peaceful and intimate hostel features 13 beds in total of which 11 are single beds and the other 2 are double beds. All guests can enjoy access to the patio/balcony and the hostel's garden. Hostal Mundo Nuevo is found in a charming wooden house in Ancud and uses solar power to provide hot water. It has a large terrace with a glass roof, and offers all kinds of accommodations - from dorms, singles, and doubles with shared bathrooms, to ensuite rooms with 2, 3 and 4 beds. Even better, they all have a view of the ocean! Breakfast is offered to each guest and consists in homemade bread, yoghurt and fresh fruits. The friendly staff speaks Spanish, English and German and can help you with detailed information to help you plan your days out and provide you with maps for biking and hiking tours. Hostal Mundo Nuevo also offers a book exchange, internet, laundry service, parking, luggage storage, a cable TV, organized tours to the penguin colony of Punihuil and bird colonies, whale watching, visits to the Spanish fortress and UNESCO churches and children are always welcomed in the property that also features a children's playground. Relax on the sea-view terrace, snuggle up in the cozy living room, or cook up a nice dinner in the fully equipped kitchen and enjoy your stay in Hostal Mundo Nuevo! Lanita Hostal is situated in Dalcahue, a historical site of trade for rural communities, and nearby islands, found on the banks of the canal, giving easy access to fresh produce of the fisheries, agriculture and livestock, handicrafts and textiles. Only 100m from the city's main church, the hostel is strategically located, so that you can explore the area by walking as well as through the channels of the sea. The property was created to offer to its guests a cozy, comfortable and quiet place to rest at night so that you can be in good conditions for your days of adventure on the island of Chiloe. The warm and homely hostel is a place where everyone can discover and share in a healthy and pleasant way the culinary and cultural richness of the island of Chiloe and of their own country. The hostel includes free breakfast, free internet access, security Lockers, free parking, laundry facilities, self-catering facilities, a cable TV, 24 hour security and all rooms at Lanita Hostal have wooden interiors and feature heating. There are double rooms and triple rooms available at Lanita Hostal, both with shared bathrooms. Chiloe Austral Hostel & Tours is a backpackers hostel located in Ancud, Chiloe Island. The hostel is only 800 m away from the beach or the "costanera" avenue, 400 m from the downtown area with the main square, the regional museum, the cathedral and local market where you can buy seafood, fresh fruit and vegetables and try the delicious local cuisine. The property is 200 m from the Cruz del Sur bus station and 800 m from Ancud bus station. Mocopulli Airport is 65 km away and parking is available at an extra cost. Hosted by its builders and owners, a Chilote family, all born and raised on the island, the hostel offers guests the possibility to learn more about their fantastic culture, including its traditions and lifestyle, such as the "curanto", a typical meal which they can prepare for you. Each room, double rooms and shared dorms of 5 to 6 beds, features hardwood floors, a rustic decor, shared bathrooms, a cable TV and a great panoramic sea view from which you can enjoy the beautiful sunrises and sunsets. 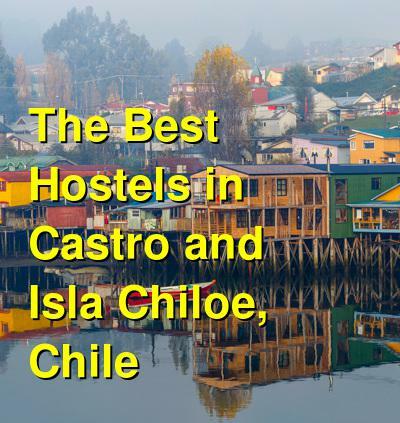 You will experience a wonderful stay at Chiloe Austral Hostel & Tours. You can enjoy the roofed barbecue area, the entertainment room which has cable tv, wireless internet connection, board games or just sit and relax at the porch on the second floor. Full-day tours and excursions as well as cars, bikes and kayaks rentals for a surcharge are offered at the property. The hostel includes a laundry service, a communal kitchen and a typical breakfast from the region which includes breads, homemade jams, fruits and coffee.